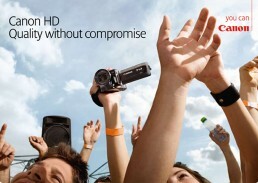 We featured the Canon HD camera at a music festival to lend it appeal and relevance to its millennial target group. Canon liked the way the simple but surprising crop and sea of hands put the product benefit center stage. The target market liked it too, with the camera being a top seller in its field.